The 2851070 Jango Fett Pen is a pen which has a Jango Fett minifigure. You could take the minifigure out of the pen, but the legs cannot move, and are attached to the minifigure's body. The helmet also has a stud on top of it. This is a description taken from LEGO.com. Please do not modify it. 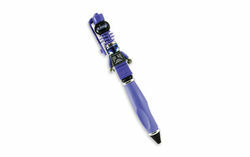 (visit this item's product page) This pen is the ultimate galactic bounty! Bounty hunter Jango Fett is on the prowl – and on your pen! Choose from a variety of unique pieces to assemble and reassemble your LEGO® Star Wars pen in any configuration you can imagine. Facts about "2851070 Jango Fett Pen"